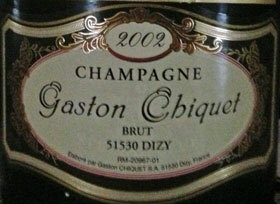 A Grower Champagne with 23 Hectares of Grapes; I was Impressed Immediately! 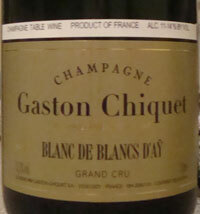 Nicolas Chiquet planted his first vines in 1746, and Gaston Chiquet formed the Gaston Chiquet Champagne label in 1935. 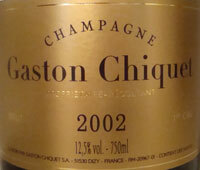 Now 8 generations after the first vines were planted, the Champagne is made by brothers Antoine and Nicolas Chiquet. “Our goal is to maintain the quality we have inherited” they state. They have 23 hectares, all premiere and grand cru, with 40% Chardonnay, 40% Pinot Noir, and 20% Pinot Meunier planted, an average vine age of 27 years, and they are grown in environmentally friendly ways. Grapes are harvested by hand and transported in ventilated crates. The vineyards are in Ay, Dizy, Hautvillers and Mareuil-sur-Ay, and the brothers Chiquet produce 16,700 cases yearly. No barrel aging is used as Nicolas believes it unnecessary: concentration, fruit maturity and malolactic fermentation are enough for appropriate body and texture. Although I've just had my first bottle as I write this (notes below), I'm a believer. This is the most exciting new Champagne I've had in a while! Champagne critic Peter Liem states "While Chiquet's wines have always had a lot of character, I feel that in recent years they have also been increasing in finesse, making them even more compelling. Réserve Blanc de Blancs d'Aÿ Brut: (Grand Cru) Currently magnums only, my favorite format! Thanks to my friend Paul, I recently tried the NV Cuvée Tradition and was blown away. I NEED more of this stuff, and am getting it (yes, I have gotten much more from Gaston-Chiquet). A wine of finesse. A bit more body and I would have rated it an A- and that may come with a bit more age. The nose has some yeast, apple, expansive light earth, apple core, and light bouncy citrus. On the palate, orange flowers, lime, with vanilla custard on the end. The nose is simply awesome (my notes read "friggin wonderful nose") with immediate cookie dough and orange citrus. With air, some marine notes emerged as well, maybe sand dollar or sea urchin. Spectacular! On the palate this was very precise and delineated. Fullbodied, rich, creamy and firm. A touch of apple sauce. Appropriately sweet, and as it warmed a touch of lime. 100% Chardonnay from the Village of Aÿ. On the palate, a good mouthfeel with pink flowers, sweetness, minerals, sea salt. It's quite long with a orange creamsicle quality as it warmed. This is more about minerals and delicate flowers than anything else, and lovely. Nose: Fresh baked whole wheat bread, well integrated apple. chalk. A little orange and other citrus with air. 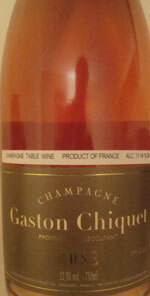 On the palate it is creamy with orange and tangerine, very fleshy initially with peach. Plenty of underlying minerals. This is young and only going to get better.